My new project is inspired by this type of design. Since I'm not even sure what it's called properly, finding a tutorial has proven difficult. So I wonder, is there a smart way of breaking it up into strips and then blocks for piecing? Do I start with the center 9-patch and go outward or make identical quarters and put the center in during final assembly? I believe the design is called "Trip Around the World". I know there are tutes/instructions out there that show you how to piece strips and then cut. Yes, it is a Trip Around the World quilt and it can be strip pieced. 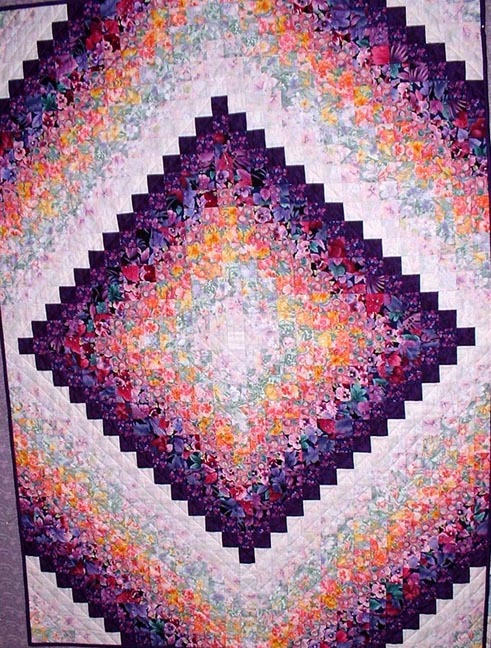 Bonnie Hunter has a really good and easy tutorial at her Quiltville site at the link posted above. Last edited by Tartan; 06-11-2013 at 11:12 AM. I might need to make another of these now that I've gone back and looked at it! Good luck - would love to see your progress! Check out www.quiltinaday.com Eleanor Burns has a book for this pattern and I believe there is a video on her site. It is a Trip Aound The World. I also like the Triple Around The World. They are alot alike. Should be easy to find something on them. Just google the names and see what comes up. I would highly recommend Eleanor Burn's book listed above. She gives directions that are very easy to understand. Your library may have a copy. I have done several of these. I usually color the squares out on graph paper, then sew each vertical row (I start form the left) at a time into long strips. Then I move on to the next row, and sew it to the first row, and so on. After a few rows, the pattern starts to emerge. This may seem like more work, but I like to have the pattern to refer to. I tried (once) to sew in block sections, and ended up ripping out the whole thing I had done, and went back to doing it my own way. the nice thing about this is that it is a great way to use up your stash ; you can use as many colors as you choose to complete the "trips". 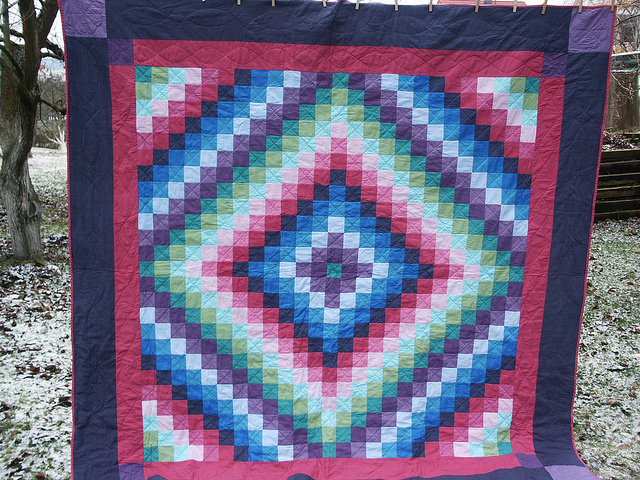 Your quilt brought back a funny memory of my early days of quilting in 1998. I attended my first quilting class about 3 weeks after taking up quilting and we were going to be making a Water Color Quilt. We were to bring all of our supplies including a design wall/board and floral fabrics to class. Well, right off the bat, I missed the "floral" part of the fabrics and brought the wrong fabrics which were all tone on tone. I "built" a design wall with 2 - 3' X 5' sheets of form core and flannel not knowing a design wall was a piece of flannel, an old flannel backed table cloth, or a yard of batting. As I set-up I noticed I was the only one with such a large design wall but there was no way to hid it at that point. On to making our blocks. A couple of hours into the class, quilters began placing their blocks onto their design walls and my blocks in no way looked like theirs. Finally, the instructor came to my station and was trying to help me arrange my blocks. After about 15 minutes, she stopped and said, "I am sure you will come up with something when you get home" and walked away. Sure enough I did....my Water Color Quilt turned into a Trip Around the World Quilt. Since then I have won ribbons on my quilts, had one hang in a museum, been published in a book, design patterns, teach quilting classes and invented a series of rulers under the name of Ruler Revolution shown at www.rulerrevolution.com So, I guess my Trip Around the "Quilt World" quilt was an omen of what I would be doing as a quilter. Thanks for sparking that memory. Thank you all for the links and beautiful pictures! You ladies make amazing quilts. And now that I've seen the tutorials, I once again realize that I didn't pick the easy way to go about this project... my rows are not repeating in the same order. *facepalm* As my dad used to say, "If we don't have any challenges to overcome, we'll create them and then overcome them most heroically". well , be sure to post a pic when you are done!! we'd love to see it!! !